Wondering what cushion to buy? The buying guide below will help you pick the right types of cushion to match your needs and personal style. Tokyo Floral Filled Cushions. Get them here. Cushions come in several different varieties. Let’s run through the most popular. While we might think of a ‘pillow’ as something we sleep on, the small cushions you find on sofas and armchairs are known as ‘throw pillows’. They’re mostly there to serve a decorative purpose, helping to provide colourful accents and bring the living room together. They’re also useful for providing support for the back, spine and neck. Throw cushions tend to be square, though they can come in pretty much every shape imaginable. Mixing and matching shapes helps create a more informal feel. These are designed to sit on top of hard, wooden chairs. They have been around for centuries, and have been sewn onto the structure of the chair itself since the Victorian era. If you prefer separate cushions, you’ll want to shop for one that can be tied to the rear support of the chair - this will prevent the cushion from slipping onto the floor. Chair cushions typically come in two different sections: a bottom and a back. These can also be connected to form a single long cushion. They’re also known as seat pads. Bench cushions serve much the same purpose as chair cushions, except they’re long enough to cover an entire bench rather than just a single chair. Like chair cushions, they often include a bottom and a back. Some specialised cushions, such as those designed for church pews, can be made to span the entire width of a large building. Bolster cushions are long and usually cylindrical, and offer additional support for the back and arms. They tend to be placed in the centre of a sofa, in between collections of square cushions. Alternatively bolster cushions can be used in bed, to restrict movement while you sleep. A variety of different fillings can be used inside cushions, with some featuring a blend of materials. The majority of upholstery cushions are stuffed with synthetic foam. This material can be shaped to fill just about any design, or chopped into tiny pieces for extra softness. Most foam cushions are made from polyurethane, which comes in varying densities. They emerge from the factory slightly harder than they ultimately end up – most foam cushions become around 25% softer during the first few months of their life. Foam cushions are typically wrapped in a protective cover made from polyester. Feathers are a soft, comfortable and natural material for stuffing. A combination of down and contour feathers are usually used. The former are the fluffy sort used for insulation; the latter are longer and tougher. The greater the proportion of down feathers, the softer the cushion will be. This means more comfort, but it’ll need to be maintained regularly – primarily by plumping. Synthetic fibres are an alternative to feathers. They offer a different feel, and are suitable for those looking to avoid animal products, and those with allergies. The two types of synthetic fibres that are used most often are hollow fibres, which are soft and springy, and ball fibres, which are shaped into tiny balls. 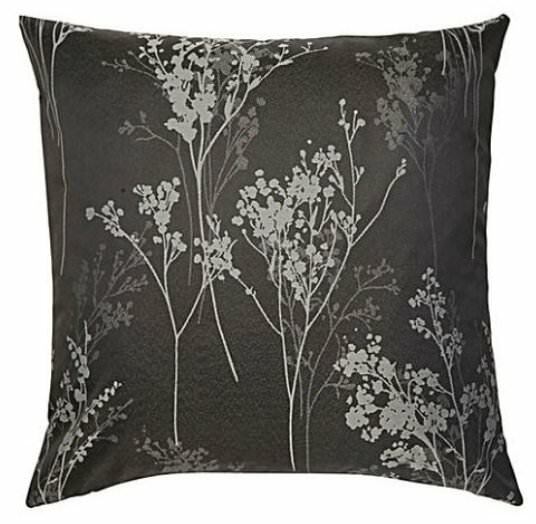 When selecting a cushion, you’ll want to think about its appearance once it’s in the room. This means your main consideration will be the colour of the sofa it’s going to be placed on. Try pairing a sofa in muted tones with brightly coloured cushions, or plain colours with patterns. What Size Cushion to Buy? There are many different sizes of cushion to choose from, and not all of them will complement every sofa. Too big and they’ll overcrowd it; too small and they risk looking a little lost. If you’re buying several different cushions for the same sofa, then be sure to choose contrasting sizes and colours. As we’ll see, pairs of matching cushions can be used to create compelling arrangements – but as a rule, try to avoid investing in more than two cushions of the same size. Single-coloured cushions, or those featuring simple block patterns, work well alongside cushions with more intricate patterns. A rule of thumb is that it’s difficult to get more than one pattern to sit well, but as we’ll see, this is a rule that’s made to be broken. Some throw cushions feature details like corner tassels and frilly borders. Again, these can help to make a feature of a decorative pillow (just try to restrict yourself to one or two cushions decorated in this way). Not every material is suited to every home, or every homeowner. If you’re allergic to feathers, then a synthetic filling is the obvious choice. Softer, more comfortable cushions may need more maintenance, and they may well cost more, too. If you’re not going to be sitting on them, then this is wasteful. It’s therefore worth choosing cheaper stuffing in cushions that are purely decorative. Another thing to consider is how easily your cushion can be cleaned. Some are dry clean only (although a quick wipe is unlikely to do any harm). Others (such as those that are 100% cotton) can be washed in the machine. So you’ve picked your cushions and placed them on your sofa; it’s now time to arrange them. Step one entails choosing your base colours - the cushions that offset the colour of your sofa. They can be in a single bold colour or an elaborate pattern. Place them at angles at either end of the sofa. Next, create a second layer. To do this, pick a different fabric and place one or two cushions in between the first pair. If you like, you can stop there – it’s easy to overdo it, after all. Making your second ‘layer’ of cushions a different shape to the first creates a more casual feel. Since it’s the smallest layer you can (if you wish) choose bright colours and bold patterns without risking overpowering the room. It’s almost always best to stick with an odd number of pillows – an even number of cushions risks, paradoxically, looking unbalanced and overly stuffy. Three or five cushions is normally optimal. That said, you don’t want to overcrowd one side of the sofa at the expense of the other, so try putting a small amount of larger cushions opposite a larger number of small cushions. If you’d like to get more experimental, you can try mixing different patterns and textures. This involves a little bit of trial-and-error, as there’s a definite risk that the results will look messy. Get it right, however, and you can achieve far better results than you will going ‘by the book’. If your sofa is set into the corner of the room, then you’ll need to take a slightly different approach, as you have three corners to think about rather than just two. The same principles, however, still apply. Get your basic cushions into each of the three corners. You might try to give one, usually the middle one, a slight accent by adding another colour or shape. 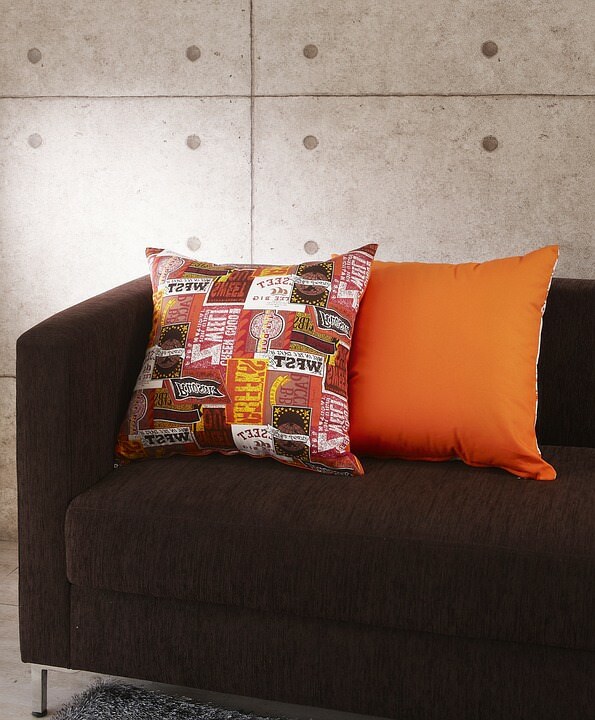 Shop our complete range of cushions here.